Less than a week after the United Nations Security Council unanimously adopted a resolution condemning North Korea for test launching several ballistic missiles, the United States is set to launch an unarmed Minuteman III intercontinental ballistic missile on Wednesday from Vandenberg Air Force Base in California. The missile, carrying three dummy warheads, will be fired across the Pacific toward the missile test range at Kwajalein Atoll in the Marshall Islands, with a flight time of about 30 minutes. According to the Santa Maria Times, the test scheduled for early Wednesday morning is intended to test the reliability and capability of the missile system. The United States currently deploys 500 Minuteman III missiles, kept on high alert and each carrying a single nuclear warhead with a yield, depending on the configuration, of 170 kT or 335 kT, respectively 10 or 20 times more powerful than the U.S. atomic bomb that devastated Hiroshima. The ongoing conduct of these tests represents yet another example of U.S. exceptionalism; the U.S. feels no embarrassment in criticizing others for the same activities it or its allies engage in. For instance, days after the North Korean tests the Bush Administration “offered an unprecedented defense and rationalization of India’s missile test and nuclear programme” following India’s test launch of a nuclear capable Agni-III missile. The tests of such weapon systems is ill-timed following the international chorus of condemnation, partially led by the U.S., of the North Korean tests. In the regional context of the Korean Peninsula, given the heightened tensions surrounding North Korea’s nuclear weapons program, the U.S. test of a nuclear capable missile is unambiguously provocative. In the global context, the U.S. missile test is blatant hypocrisy, symptomatic of a dangerous foreign policy based on the imposition of discriminatory, self-serving norms backed by the threat and use of force. The headlines in recent weeks have been full of the latest “threat,” this time a possible missile test by North Korea. The Bush administration has filled the airways once again with bellicose rhetoric, ranging from the now-routine “all options are on the table” to threats to shoot the missile down with U.S. ballistic missile defense interceptors. As Jeff Lewis and Victoria Sampson argue persuasively in a series of posts at Armscontrolwonk.com, the shoot-down talk is almost certainly an empty threat, intended only for consumption by those who know nothing about either ballistic missile defense or the likely trajectory of North Korean missile tests. Not to be outdone, leading Democratic Party “national security” figures, including Clinton-era Defense Secretary William Perry, are suggesting a pre-emptive strike against the North Korean launch site, claiming that the outcome of this unvarnished act of aggression would be not only predictable but positive. The mainstream media and U.S. political elites seem permanently locked in a deadly symbiotic embrace: for the media, “if it bleeds it leads,” for the political elites, “if we kill it sells.” Or so it seems, more and more in this grim new American Century, where “diplomacy” seems to mean little more to those who wield American power than threatening force for a bit longer before using it. The confrontation between the U.S. military behemoth and North Korea’s possible nuclear weapons and its still-theoretical long range missile capability works well enough, in any case, for the elites of both states, each growing progressively more isolated from the rest of the world, although in different ways. What each may fear most is their own growing irrelevance: North Korea to the world as a whole, the United States to East Asia, where convincing key states� such as Japan and South Korea–that it remains an “indispensable nation” is a critical element in slowing U.S. descent from the zenith of its power (now clearly in the rear-view mirror of the U.S. juggernaut, however much we may debate how many mileposts have passed since the peak). For North Korea, fueling up the missile (if that is what they actually are doing) gets the world’s attention by slapping the “rogue leader with nukes (maybe)” bargaining chip on the table once more, particularly with the U.S. government and its echo-chamber media playing the role of both predictable antagonist and massive message amplifier. Thomas Schelling, Henry Kissinger and company may have invented the “madman theory” of deterrence and diplomacy, but no one has gotten more mileage off less fuel with it than North Korea. As for U.S. elites, the North Korean “threat,” particularly with the added fillip of an endless nuclear and missile crisis, is a good excuse for the U.S. to maintain its massive military presence in the region. It also is a major selling point for ballistic missile defense, both at home and abroad. Defenses against strategic missiles are an arms contractor’s dream: arcane, extremely expensive technology, for which there is a potentially unlimited demand, that is unlikely to be tested in any battle likely to be followed by rational debate over its success or failure. In this regard, the current round of North Korea missile-threat fear mongering may already have served its purpose. Last week the United States and Japan inked a pact for further cooperation on missile defense development, and this week Japan agreed to the deployment of Patriot 3 missiles, designed for defense against aircraft, cruise missiles, and shorter range missiles. While neither of these agreements may have been caused by the current North Korea missile test scare, they may provide useful political cover for the government of Japan, where increased cooperation with the U.S. military is controversial. Sunday, I was at the Nevada Test Site, speaking at a demonstration against Divine Strake, a high explosive test that will detonate 700 tons of high explosive to simulate the effects of a low-yield nuclear explosion. One of the main points of my talk there was that mainstream debate about U.S. weapons programs remains largely confined to how best to pursue military dominance in service of what really is a global empire. Whether either empire or the use of overwhelming violence to sustain it are acceptable remains well outside the realm of “reasonable” discussion. One can never know what someone really said to a reporter, or what the context was–reporters’ agendas frame the interview, and inevitably drive the choice of quotes. But to put it simply, anyone who thinks that its good for the U.S. to spend a single dime on new, more useable strategic weapons, whether nuclear or conventional, is not on the same side of the global struggle that I am. Further, under anything like the current distribution of wealth and power and with nuclear arsenals still numbering in the thousands, substituting a few highly accurate, destructive, and usable “conventional” missiles for nuclear ones will not reduce the nuclear danger. In the real world of a military industrial complex intertwined with thoroughly corrupt political and corporate elites firmly committed to global military dominance, we won’t get conventional strategic weapons instead of nuclear weapons. We will get dangerous numbers and varieties of both. 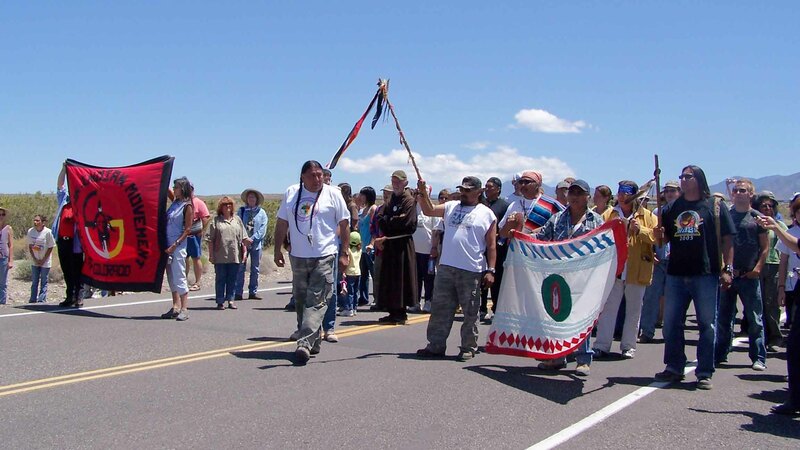 On May 20th, there will be a demonstration at Vandenberg Air Force Base, near Lompoc, California. Vandenberg is a major test facility for U.S. nuclear missiles and other strategic weapons and a command center for U.S. military space operations. It plays a continuing role in the wars in Iraq and Afghanistan, coordinating the use of military space technologies to assist ground warfare, and likely will be used to test next-generation strategic weapons, both nuclear and conventional. It also is one of the two sites where mid-course ballistic missile interceptors have been deployed. For more information on Vandenberg Air Force Base, see the Western States Legal Foundation(WSLF) Information Brief, Vandenberg Air Force Base: Where the Present and Future of U.S. Warmaking Come Together. For updates and information on parking, car pools., etc. for the May 20th demonstration, visit the web site of the Vandenberg Peace Legal Defense Fund. On May 28th, there will be a rally and demonstration against the Divine Strake weapons high explosive test at the Nevada Test Site. One of the main purposes of the Divine Strake test is to simulate the effects of low-yield nuclear weapons against underground structures. With strategic weapons research proceeding on a number of fronts ranging from the continued modernization of intercontinental ballistic missiles and research on next-generation missiles and bombers to refinement of plans for nuclear weapons use through experiments like Divine Strake, the United States is leading the world into another century of arms racing. For more information on Divine Strake, see previous entries on this site; for a short overview see the Western States Legal Foundation Information Brief, The Divine Strake Nuclear Weapons Simulation: A Bad Signal at a Bad Time. For more on the role of the Nevada Test Site in weapons development past and present, see the joint WSLF/Nevada Desert Experience Information Bulletin, The Nevada Test Site: Desert Annex of the Nuclear Weapons Laboratories. 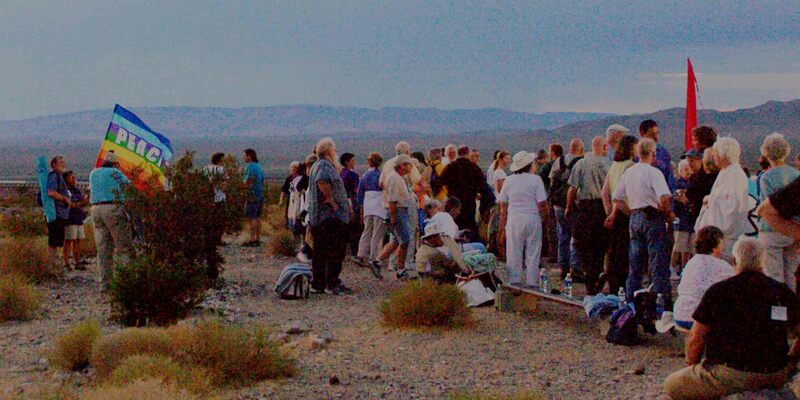 For updates and logistical information about the May 28th Nevada Test Site event, check the Divine Strake pages at Citizen Alert, the Shundahai Network, and the Nevada Desert Experience. I will be speaking at both of these events. If you are a DisarmamentActivist.org reader and are at either event, I hope we get a chance to meet. “The detonation could simulate ‘a number of weapon concepts,’ said Doug Bruder, director of the counter-weapons of mass destruction program for the Defense Department’s Defense Threat Reduction Agency. ‘It could be nuclear or advanced conventional,’ he said. ‘A charge of this size would be more related to a nuclear weapon.’” Launce Rake, “Test blast linked to nuke weapons,” Las Vegas Sun, April 28, 2006. To the extent that they confirm the nuclear weapons research and planning applications of Divine Strake, Bruder’s statements are consistent with previous government descriptions of the test series of which the test is a part. DTRA budget requests and other government documents reveal ongoing research aimed at better understanding how low-yield nuclear weapons can be used to destroy underground targets, and at upgrading strike planning techniques for determining what kind of weapon, whether conventional or nuclear, can best be used to destroy particular types of targets. For more analysis and document references, see previous posts regarding Divine Strake on this site. UPDATE: Part of Bruder’s remarks were broadcast in another CNN segment: The Situation Room, April 27, 2006 (transcript here). I have written a two page information brief, “The Divine Strake Nuclear Weapons Simulation: A Bad Signal at a Bad Time,” for the Western States Legal Foundation. The information brief is available on the WSLF web site as a pdf file (click here). It summarizes some of the material regarding Divine Strake previously posted here, and provides contact information for the coalition opposing the test. Did the WashPost Miss Explosive Story? Both reports subsequently were denied by government sources. Nonetheless, It is virtually certain that they are to a large extent true. There undoubtedly are plans being prepared for possible attacks on Iran, and that process likely includes examining (if not choosing) nuclear options for hard to destroy facilities. All the evidence except the government denials themselves suggests that data from the “Divine Strake” test will be used to refine understanding of nuclear weapons effects on underground structures, and that such understanding will be incorporated into the tools and procedures used to plan and execute nuclear strikes (In a previous post I provided a summary of the Divine Strake coverage, including government denials and responses to them). In my Friday March 31 entry “Did the WashPost miss an explosive story?” I provided evidence that the “Divine Strake” experiment which will detonate 700 tons of explosive in the Nevada desert is intended to simulate the effects of a low-yield nuclear blast on underground structures. Since then, there has been a round of investigation and commentary by various reporters and arms control experts, summarized below. In the early rounds the Defense Threat Reduction Agency (DTRA) confirmed that Divine Strake was indeed the “Full-Scale tunnel defeat demonstration using high explosives to simulate a low yield nuclear weapon ground shock environment at Department of Energy’s Nevada Test Site” described in last year’s budget request. Later, DTRA changed its story, claiming that language suggesting that the purpose of the “Divine Strake” test had changed, and that language regarding its nuclear weapons applications had been left in this year’s budget request by mistake. “The Defense Threat Reduction Agency (DTRA) today confirmed to FAS that the upcoming Divine Strake test widely reported in the media to be a non-nuclear event is in fact a low-yield nuclear weapons calibration simulation against an underground target…. The Washington Post ran a story Friday headlined Pentagon to Test a Huge Conventional Bomb. Essentially, everybody quoted in these articles is making “lawyer’s arguments” narrowly addressing the palatable title and superficial rationale for the program — making the nuclear stockpile more “reliable.” The new matter here, such as it is, is ex-weapons designers getting frustrated enough to denounce the program as pure pork. Unfortunately, it isn’t– those in power really do have missions in mind for nuclear weapons. Of course, visions for future military technologies encounter far less resistance when they follow money flows already firmly established.